ARIES NERF BARS/BOARDS - The Topper Shop Inc. There are a lot of side accessories out there, in every shape, diameter and finish. Finding one that stands out can be a challenge. That is why each new ARIES side bar and running board design begins with an innovative idea. ARIES running boards and side bars are available in multiple sizes, tube profiles and finishes to give you a solid step up and the freedom to customize. Our AdvantEDGE™ side bars are particularly unique with their octagonal tube profile and all-aluminum construction. Our RidgeStep™ running boards and AdvantEDGE™ side bars are made for easy installation with the ARIES VersaTrac™ mounting system, and all ARIES running boards and side bars are made for a vehicle-specific, custom fit. When it comes to your next step, don’t gamble. Step up with unique, reliable side bars and running boards from ARIES. If you live to get behind the wheel, fire up that engine and give your truck a fresh paint job in mud-brown, then you want side bars with a little extra beef. ARIES 6″ oval side bars offer a bold 6″ diameter with a generous 5″ step pad. 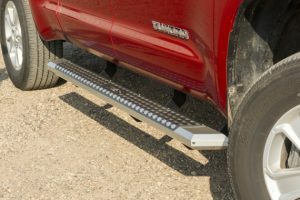 These extra-wide side bars feature a universal design that allows them to fit multiple makes and models, and they mount using vehicle-specific brackets. The brackets are sold separately and allow the sides to perfectly match your vehicle and install with ease. ARIES 6″ sides are made with an original-equipment (OE) styling and are available in two finishes — including aluminum and stainless steel — and four different lengths. For some, driving is more than getting from point A to point B. It’s about finding definition and customizing the experience. 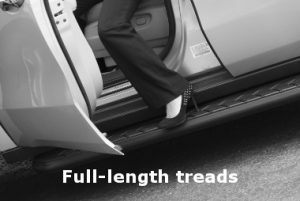 ARIES AeroTread™ running boards give new definition to your drive with their sleek design, full-length treads and flawless finish. They feature unencumbered aluminum construction and a custom contour to redefine your look and offer a solid step up. ARIES AdvantEDGE™ side bars do away with the common, rounded look of other side bars and nerf bars, featuring an eight-sided tube profile, an angular design and an all-aluminum construction. They use the ARIES VersaTrac™ mounting system with vehicle-specific brackets for a faster, more secure installation, and they are available in two different finish options, giving you total freedom of customization. 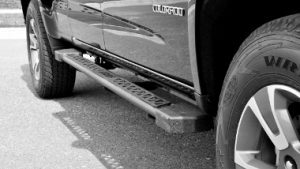 There are countless side bars, nerf bars and running boards out there, as well as many different products designed to protect your vehicle’s rocker panels. However, when your truck is beefed up and built out the way it was born to be, you need a step up from ordinary. You need a step that perfectly balances the qualities of a rocker guard and a running board. 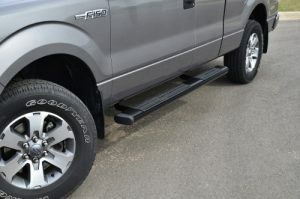 ARIES 3″ rocker steps are the ideal side accessory for the off-road-style truck or Jeep, featuring extra protection for your rocker panels, a convenient 3″ wide step up, and enough ground clearance to allow your vehicle to hold nothing back.